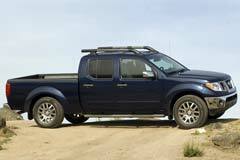 The Nissan Frontier has remained a very popular truck for a wide variety of customers. Its comfortable size and powerful engine have been upgraded over the years. However, the Frontier has remained true to its compact truck design for the most part. The first models of the Nissan Frontier were designed with a smaller cab and less power than later models. There was, however, a larger King Cab option. Additionally, a four cylinder engine with 143 hp came standard. In 2000 the Frontier upgraded to a four door Crew Cab. Later models saw the boxy style grow into a more sculpted design. A more powerful 3.3 liter V6 engine with 210 horsepower was also offered, making the Frontier more competitive in the compact truck market. Customers looking to buy a used Frontier will notice that models prior to 2009 look quite different than those made after it. Buyers should also look at the safety options available on a used Frontier and choose the trim that best fits their lifestyle. The Nissan Frontier can be a great option for those in the market for a compact truck with mid-size truck appeal.